Remember last week, when I told you I put this chicken on a salad? It wasn’t just any salad. It was a total grand slam of a salad, bursting with freshness and summery flavors. I knew I had to share the recipe at first bite. I’m going to get right into it because I imagine I knocked half of you off the board with cilantro. People either love it or they hate it. I am a cilantro fan. Obviously. I used it in this salad three times. In the dressing, in the roasted corn, and as a garnish on top. If you are one of those people who think that cilantro tastes likes soap, then just leave it out! You can still have the saucy chicken and cilantro-less roasted corn and a different dressing of your choice! This salad will still be fab without cilantro, but if you’re a cilantro lover? You’ll be dead when you taste this. In a good way! We have the amazing, juicy, saucy, easy chicken from last week. We have super savory oven roasted cilantro corn, which is now one of my new favorite things. Then we add another punch with aged white cheddar and a super bright cilantro lime dressing. This is my new favorite salad and I’m going to make it all summer. Join me? Blend all ingredients except for salt and pepper. Once smooth, add salt and pepper to taste as desired. I prefer to make this the night before serving so the flavors have time to meld. Keep dressing refrigerated. Preheat oven to 400 degrees. Line a baking sheet with parchment paper or foil. Toss corn, cilantro, oil and seasoning salt together, then spread out on baking sheet. Bake for about 25-30 minutes, tossing a few times during the cooking process. Once corn starts to get darker in color, remove from the oven. To assemble salads, divide greens evenly on four plates. Drizzle each with dressing. 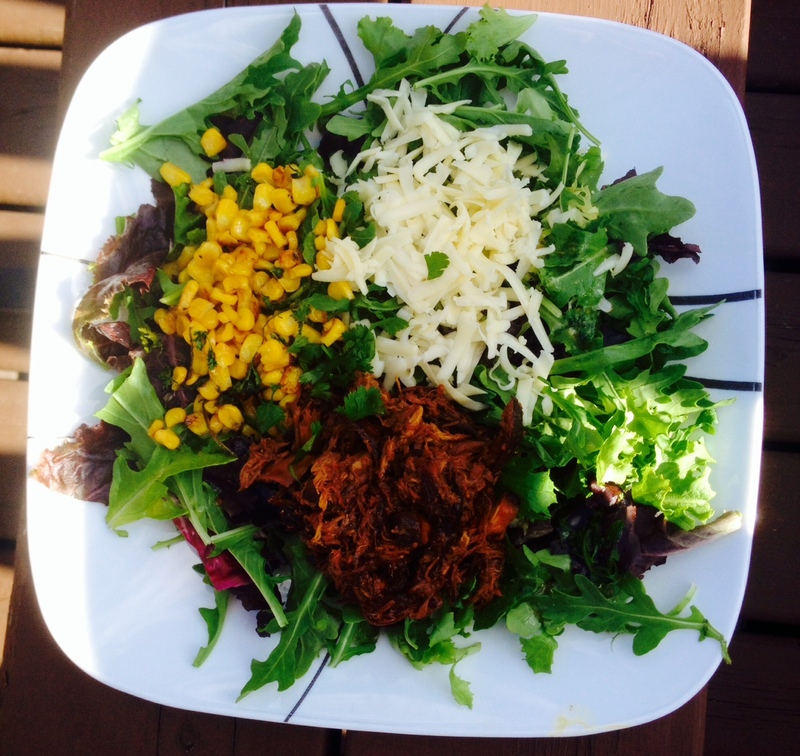 Top each salad with 3/4 cup of chicken, 3/4 cup of corn and ¼ cup of shredded cheese. Top with extra fresh cilantro if desired and serve!